Submitted by keenan on Tue, 2008-05-27 12:25. Atlantic Yards Report has a thorough recap of Assemblyman Richard Brodsky’s hearing on West Side development held last Friday. Brodsky, who chairs the Assembly Corporations, Authorities and Commissions Committee, used the opportunity to question Deputy Mayor for Economic Development Robert Lieber, ESDC’s acting president Avi Schick, MTA Chair Lee Sander and others about the public investment and current status of Hudson Yards, the 7 line extension, and, of course, Moynihan Station. We’ve excerpted some Moynihan-related items below, but the entire recap is worth reading - especially an exchange about using eminent domain for MSG. The Observer has a brief article on Sander’s comments about bringing light rail to the West Side and WNYC focused on comments about expanding Amtrak service at Penn Station to obtain further federal funding for the Moynihan project (see our related posts on a federal proposal for NY/DC high speed rail). When it came to the Moynihan Station project, which could involve a new rail station in the Farley Post Office, the relocation of Madison Square Garden, and new office towers and retail over the current Penn Station/MSG site, Brodsky had the same basic questions. “How do I know how the public investment should be made versus private--what’s the rule?” he asked. It’s not a simple answer, Schick said, saying that the working number is $125/square foot--the figure Levin later disputed. Brodsky again asked about the appropriate relationship between public and private investment. “We take into account the nature of the project,” Schick replied gnomically. Brodsky acknowledged he was facing a formidable rhetorical foe. “I’m going to get you, Mr. Schick, but it’s going to take a bit longer,” he said playfully. Brodsky brought up the apparent effort by Madison Square Garden to get government to advance the cost of building an arena. “To my understanding, it’s not for the Garden, it’s for the [Moynihan Station] project,” Schick said. Has the Garden asked for such support, Brodsky asked. Brodsky amended his question: Has the joint venture--involving Related Companies and Vornado Realty Trust--asked for such funding. Lieber added the entire financing plan was under discussion. In closing the hearing, Brodsky said the general question of whether we’re subsidizing projects at an appropriate level still remains. Still, he said he appreciated the government officials’ willingness to answer questions at a public forum, calling it an important part of the governmental process. “I hope we can move forward on these [West Side] projects,” he said. “I fear we’re in more trouble than we’re letting on.” (He noted that it was news to him that the hearing brought out the city’s commitment to spend up to $3.5 billion on the #7 line, given that he'd previously criticized the city for committing to only $2.1 billion.) He said he was recessing rather than closing the hearing, given that he hoped Port Authority representatives would testify as well. Does the legislature have any power, he was asked after the hearing. While it may not have direct oversight of such project, he said, in the long run the legislature has the power to pass laws restricting certain actions. Again he criticized governance mechanisms to manage projects that bypass democracy. "What we've structured is a set of governance mechanisms that eliminate democratic institutions," he said. "And the net result is that anonymous people.... this is a set of Soviet-style bureaucracies that are acting without any public accountability, even when they’re right. They would much rather discuss whether they're right or wrong.... The reason we're in this problem with these projects is that the governance is secretive and out of touch, and we don't have enough money." Doesn't Brodsky favor a new authority, however, to oversee the Hudson Yards project? "A foolish consistency is the hobgoblin of little minds," riposted Brodsky, never at a loss for words. "The answer is, right now, I'm wrestling with a series of emergencies and the fact of the matter is that the Hudson Yards deal does not represent a thought-out economic development strategy or priority for what the city and the region need. In defense of that, we're scrambling for ways of gaining some control. It's not necessarily intellectually consistent." "The Dolans have every right to seek public support," he said. "The public ought to deal with it intelligently. That's what this is about. This is about returning these things to the control of public agencies." Agencies, perhaps, but not--as per his comments--public authorities. Read “At West Side Hearing, Brodsky Questions Subsidies, Muses About Eminent Domain for MSG,” from Atlantic Yards Report. Submitted by keenan on Fri, 2007-12-28 12:27. Robert C. Lieber, president of the Economic Development Corporation, has been appointed deputy mayor for economic development, replacing Dan Doctoroff. 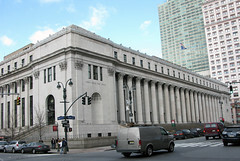 Lieber will be the city’s main liaison in the Moynihan Station negotiations. After being recruited by Doctoroff to run the EDC, Lieber led the rezoning plans for Coney Island and Willets Point, and worked with Doctoroff on Moynihan Station and Hudson Yards.